Rejuvenate your skin in seconds with this specially created body puff that brings out fresh glowing skin by gently scrubbing off the grime, dirt and dead cells. A dollop of body shampoo or a dash of soap, plus a gentle massage to work up lather and you emerge feeling refreshed and revitalised in minutes. 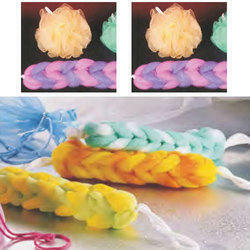 We deal in various types of Loofahs. We have a capability to provide extensive varieties of Loofah in various sizes and specifications. Become soft when you put bath gel into it and makes you more relaxing during bath time, remove dull surface flakes, refresh and vitalize your skin. - Soft sponge material ideal for baby skin. Protectmed Grey Disposable Loofah Sponge, Pack Size: 3"x5"
We have highly acknowledged organization engaged in presenting a remarkable range of Bath Loofah.